This array of ports has the power that PCI slots on old Mac towers did. But will it be as practical? That answer may depend on vendors. Photo courtesy Apple. “Pro” is a funny word. When people say “pros” in contrast to “amateurs,” “producers” rather than “consumers,” they mean something about relative seriousness. And in tech, they usually invoke these words when they’re looking down on tools they feel aren’t up to snuff. That’s fair. Especially in music making and digital art where money is tight, people invest in tools because they deliver, not just to show off. And they’ve usually been burned by something less-than-pro letting them down. So, when people see a machine from Apple dubbed the “Mac Pro,” they have certain expectations. The problem is, the upcoming Apple Mac Pro doesn’t meet those expectations. It looks like a Dyson vacuum cleaner someone lifted from the maintenance closet on the Death Star. The innards seem promising enough: powerful next-generation graphics architecture from AMD meet the latest-and-greatest computational iron from Intel. On closer inspection, the design is functional, too: Apple has cleverly organized the whole beast around the heat intake. What’s conspicious, then – what really upsets people – is the absence of internal storage bays and expansion slots. Apple’s machines have never been as upgradeable, component by component, as their Windows- and Linux-running brethren, but the most common needs to add storage media, video and audio interfaces, and the like have always been well accommodated by Apple’s pro towers. 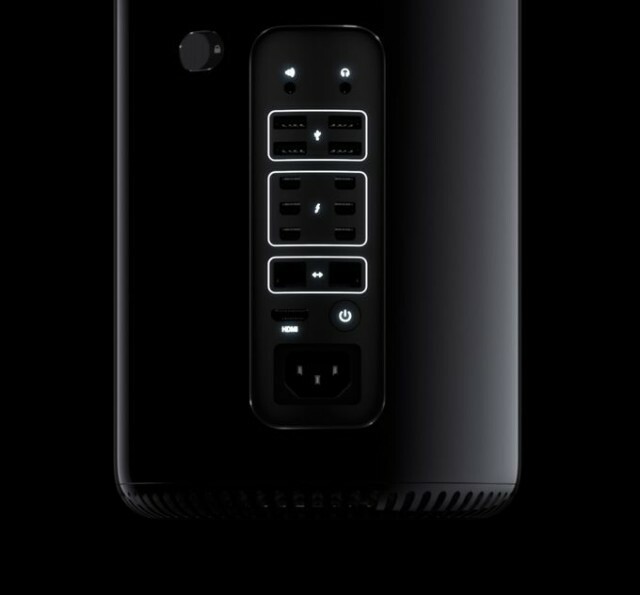 The Mac Pro is the final departure from that design. And so, it represents a formal dividing line between expansion via slots and internal bays on one hand, and external gear connected by cables on the other. This is a day a lot of us saw coming. Nor is it a trend restricted to the Mac. The PC vendors still make towers, but they have become specialist machines for gamers, producers, and server administrators, as sales in laptops (and now tablets, too, or at least Apple’s tablets) have surged. And back to that word “pro.” “Pros” have trended to buying these other form factors, too. On the Apple side, seeing a MacBook Pro, or a MacBook Air, or an iMac, or a Mac mini is commonplace in studios and workspaces. Even an entry-level Mac mini is capable of handling the needs of most people’s audio productions, even with a lot of channels and effects. So, the question is: what does the shift to cable mean for expandability down the road – for Mac desktop users, Mac laptop users, and even the PC? On the back of the Mac Pro is something a lot of people feel is missing from something like the MacBook Air: ports. Lots of them. Thunderbolt and USB3. Apple even has multiple dedicated controllers for those ports, which is a good thing for bandwidth-hungry, performance-dependent audio and video users. And here’s where there’s an edge: that added storage and I/O flexibility can make a big difference in productivity when it comes to media production. The absence of PCI Express slots is not the absence of PCI Express, the protocol by which your expansion card integrates with your computer’s main architecture. Thunderbolt actually is PCI Express. It’s an extension of that bus over a cable. It’s not quite as fast as the internal speed of the latest PCI Express 3.0 standard, or the upcoming PCI Express 4.0. But it provides more than enough bandwidth for massive configurations of audio inputs and outputs, video streams, and high-speed storage. Most accessories can’t keep up with all it does. Thunderbolt, like PCIe, is Intel technology – here, with input from Apple. It’s a de facto standard, and something you should expect to see adopted on PCs as well as Macs soon, though it’s too early to say in what numbers. There are no card slots, no extra drive bays, no GPU options on any other Apple products. Apple has effectively killed its last conventional computer. When the Mac Pro dies for good Apple will replace it in the market with a combination of Thunderbolt-linked Mac Mini computing bricks backed up by rented cloud processing, all driven from an iMac or MacBook workstation. No, actually, it won’t. Pros are aware of the bits missing from this equation. Cloud processing isn’t fast enough for real-time media work; milliseconds are a long time in media. And the mini, cool as it is, lacks the GPU needed on the graphics side. But that’s not, ultimately, what Apple did. Instead, it made a Mac Pro with the same expansion options, all made external rather than internal. Our Upcoming MADIFace XT now has ePCIe (MXO2), which is already a standard and can be easily converted to Thunderbolt. MXO2 has a much better an more stable connection and is also available for PCIe Desktop cards. Why would you need Thunderbolt when we have the first USB 3.0 interface which can handle all the 396 channel of the MADI XT? 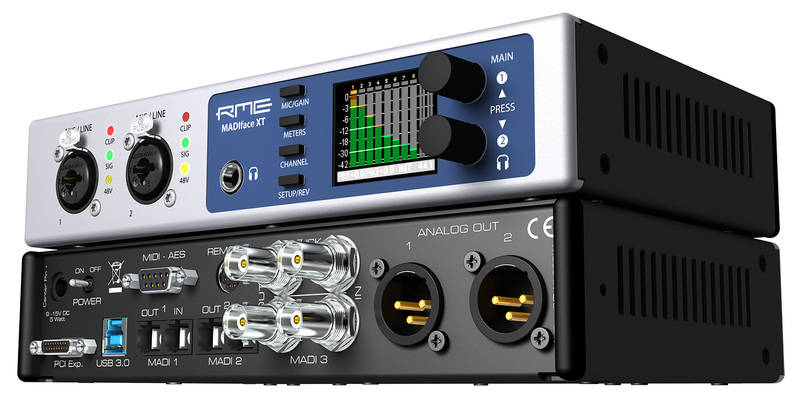 The future face of audio is external gear like this MADIFace XT from RME. And, really, given PCI cards were typically paired with external breakout boxes anyway, isn’t that a more convenient solution? One trick you can accomplish with this that you couldn’t with the PCI card: unplug it, plug it into your laptop. Done. Photo courtesy RME. So you can choose if you want to have USB 3 or PCIe or Thunderbolt if you need that many channels. Because USB 2 can already handle 64 channels in and out. Oh, yeah, lowly USB 2: the thing is, part of the reason you keep seeing Thunderbolt and USB3 associated with video or ultra-high-end displays is that USB 2 and FireWire already provide enough bandwidth for even fairly sophisticated audio scenarios. They’re good enough. Universal Audio is also enthusiastically embracing Thunderbolt; we’ve heard them sing its praises before, both for bandwidth and also, crucially, for low-latency performance. I’d like to see native Thunderbolt on their hardware rather than the current adapter-card solution; the coming of the Mac Pro seems a likely push. We can’t comment on future product development, but Thunderbolt on Windows will definitely become more relevant to our users as more PCs implement it. It’s something we’re looking into. And so while slots are really good at keeping everything neat and tidy and affordable in a machine that never moves, they’re pretty terrible for maximizing the investment you make in hardware when you make heavy use of laptops and the like. Laptop owners are happy, then, as are iMac and mini owners. But that brings us to our unhappy group: current Mac Pro users. If any of them dreamt of repurposing hard drives and I/O cards in a new Mac Pro with a faster CPU, they now face potentially-pricey expansion chassis solutions. And there are people who hate cables, fearing a rat’s nest of spaghetti around that menacing (if small) black cylinder. I don’t think each of these problems is on the same level of seriousness. Form factor and cables look like problems the intrepid Apple accessory market will attack with gusto. The new Mac Pro appears to be deliciously small and portable. It’s impossible to tell whether this form factor will work in practice until we’re testing the machine in person. But it seems likely that users will devise solutions to keep cables organized and mount the Mac Pro in racks and so on. Cost remains a legitimate concern. External devices do tend to be more expensive than internal devices, whether justified in that cost or not. And I don’t think there will be very good news for people wanting to move existing hardware. I think it’s more likely that those Mac Pros will be best kept operating as-is – and that’s why you very often see older towers running in studios for years, I think. The real question is whether the hardware users depend on now will adopt USB and Thunderbolt. With Pro Tools gear, for instance, I think adopting external connection buses like USB3 or Thunderbolt are part of what Avid must do to survive. In fact, the cash-starved company it seems would benefit from finally having a reason for all its legacy users to upgrade – if they can deliver a more cost-competitive box with external interconnects and sell it to existing studio users, plus the increasingly laptop-based producer and audio engineer market, they could have a second business boom on their hands. There’s an argument to be made that part of what has caught Avid flat-footed is over-dependence on just these towers. It isn’t just that studios are closing: even in studios, you often now see iMacs and MacBooks. I think we’re yet again in an Apple Moment. And in that sense, the Mac Pro isn’t a departure for the company at all. It’s exactly in character. The Mac Pro is a aggressive feat of industrial engineering that embodies a no-compromise approach to what Apple feels is the future – everyone and everything else be damned. We’ve been here before. Apple is also not your only choice. There really are advantages to traditional towers in cost and flexibility. There are great options for things like sound isolation. Windows 8 is a powerful operating system for music and visual production that supports almost exactly the same suite of tools the Mac users have. Linux, while certainly more niche in its appeal and with a different set of tools, also fits some people’s needs perfectly well. What it seems the new Mac Pro will do – the very thing that’s annoying many existing Apple customers – is force the transition to more high-speed external hardware for audio and video. The fact that existing Mac Pro users are so dedicated to their expansion slots, the fact that vendors the size of Avid have built whole ecosystems around it, only proves the point. It’s easy to forget that Apple has dragged us, sometimes kicking and screaming, from NuBus to PCI, 68k to PowerPC to Intel x86 (and 64-bit), Mac OS 9 to OS X. They’ve also played a major role in pushing the industry from SCSI and floppies to USB and FireWire. It seems now Thunderbolt and USB3 are next. When it comes to creative work, it’s often the Mac ecosystem that leads as others follow – it’s an easier testbed for new hardware, and a passionate audience of consumers. But if we make this leap to flexible external hardware for audio and video successfully, it’s hard to think that’ll be a bad thing. Now, it’s all a bit too soon — but that’s why Intel was pushing Thunderbolt and PCIe and USB3 at Taiwan’s Computex last week, and Apple doing the same thing (in their own way) at WWDC this week. The audience isn’t us: it’s developers and vendors. And since they’re the pros that let us be better pros, I hope they’re listening. Actually, the fact that he isn’t a Mac user may make him slightly more objective as a source of reflection on this. What we know: fast memory, fast storage, fast CPU, dual GPUs, dedicated Thunderbolt and USB3 controllers (plural) should allow for easy expansion. And this looks like an atypically portable box for all of this, meaning a desktop you can easily take onstage or between studios, etc. What we don’t know: a lot of the specs. How much storage? How much memory? How upgradeable will the internal devices be there, if at all? And we don’t know a lot of the practicalities of the design – or how this will stack up to PC options by the end of the year – or the price.